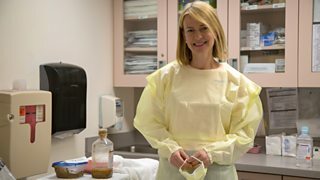 BBC Two - Trust Me, I'm a Doctor, Series 3, Episode 2 - What does a faecal transplant do? Surgeon Gabriel Weston travelled to Rhode Island in the US to watch Dr Colleen Kelly perform a faecal transplant — a procedure that has a 90% success rate when used to treat the life-threatening bacterial infection Clostridium difficile. Clostridium difficile (colloquially known as ‘C-diff’) is a bacterium that can cause severe stomach pains, diarrhoea, inflammation and a potentially fatal loss of fluids. It exists harmlessly in the intestines of about 5% of healthy people, where it is kept safely under control by all of the other ‘good’ bacteria that inhabit the gut. However, if these people fall ill and are prescribed broad spectrum antibiotics C-diff can become a problem – that’s because the antibiotics wipe out the normal gut bacteria, allowing the resistant C-diff to take over and thrive. Once C-diff is in the ascendancy it can be very hard to shift – the traditional treatment is antibiotics but a significant number of patients do not respond and are left with relentless and debilitating symptoms. Fortunately these patients now have another option – Faecal Microbiota Transplant, or FMT. FMT is where poo from a healthy individual is implanted into the gut of a patient, often by colonoscopy. The idea is that the poo, which is rich in bacteria, will restore a healthy balance of microbes to the gut which will overwhelm and subdue the C-diff. It is vital that the poo being used in the transplant is properly screened for infections and disease and it’s actually much harder to be a poo donor than you might think. At Open Biome in Boston, a non-profit company that provides screened, filtered and frozen poo for clinical use, only 6% of potential donors make it through the rigorous testing programme. Although this treatment is relatively new it has had staggering levels of success. In 2013 the results of the first randomised controlled trial using FMT to treat C-diff were published and revealed that a staggering 94% of patients recovered after a single faecal transplant. Researchers hope that this success is just the beginning. It’s thought that the population of microbes in the gut, known as the gut microbiome, could be affecting a range of diseases from Irritable Bowel Syndrome and Crohn’s Disease to Multiple Sclerosis. Right now clinical trials all over the world are investigating these links and asking whether FMT could be a solution to an array of medical problems. NICE have found that the evidence supporting FMT for recurrent Clostridium difficile infection is sufficient for the procedure to be carried out. However, it is only considered when patients have a recurrent C.difficile infection that has failed to respond to antibiotics and other treatments. If you are interested, it is best that you speak to your GP about it directly.